Coffee With Games: God of War & Punch-Out!! Mixed = Rage of the Gladiator? Arena Hours Debut! God of War & Punch-Out!! Mixed = Rage of the Gladiator? Arena Hours Debut! What do you get when you mix a mythological game setting like the God of War series has, with game-play from the Punch-Out!! series? Well, I think the results would be Rage of the Gladiator. 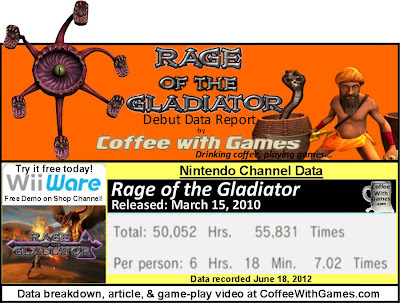 Rage of the Gladiator was released on March 15, 2010 through Nintendo's WiiWare service, and has a price point of 1,000 Wii Points, which is $10. The game was developed and published by Ghostfire Games, and it received an ESRB rating of "Teen" with "Alcohol Reference, Animated Blood, Violence" listed as content for gamers and parents to be aware of. Rage of the Gladiator's game-play hours just arrived on the Nintendo Channel this week, and how many hours have U.S. Wii owners spent battling bosses in the arena? Brew some coffee, and let's take a look! Boss battle included! Rage of the Gladiator has approximately 7,953 U.S. Wii owners that have reported data through the Nintendo Channel for its debut, with 826 days of data possibly reported. The game has an average play-time per day/session of 53 Minutes, with the total average "Per person" being 6 Hours 18 Minutes. 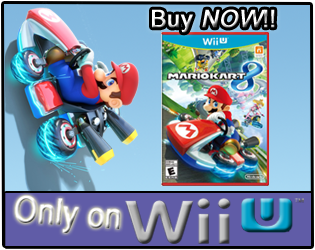 While WiiWare games are harder to find "user reviews" for because of the digital distribution, the game has a "professional" review score average of 82.08%, based on 19 reviews on GameRankings.com. Rage of the Gladiator's U.S. release has made Ghostfire Games about $79,530 before taxes and profit sharing with Nintendo, just based on the number of players that have reported data and the game's $10 price point. I purchased Rage of the Gladiator the day it released on the WiiWare service, and I have thoroughly enjoyed the game. While the average hours reported show just over 6 hours of game-play, you may be wondering, "How many hours do you have reported Coffee?" If you're wondering, you should easily get 10-20 hours of game-play out of the main mode and the game's Challenge Mode, if you think you are up for the "Challenge"! I think I can definitely say I have gotten my money's worth out of the game! If you don't know anything/much about Rage of the Gladiator, as I mentioned in the introduction, the game controls a lot like the Punch-Out!! games, which is great in my caffeinated opinion, but with the camera positioned in a first-person perspective. The game's mythological setting though, inspired by games like God of War's, allowed the developers to get really creative with the bosses in the game, and the types of attacks the bosses use are creative and varying. 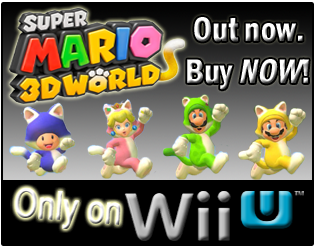 The game also has "Special Attacks", sort of like Star Punches in Punch-Out! !, that you can use after unlocking/upgrading them. I thought most of the bosses, their attacks, and the "Special Attacks" in the game were all done really well. If you are perhaps now interested in Rage of the Gladiator, make sure to download the free WiiWare demo for it on the Nintendo Shop Channel. It will allow you to battle the first three bosses in the game's regular mode, and give you a look at the skill tree as well. Have any of you played and beaten Rage of the Gladiator, even finishing Challenge Mode? If so, did you finish the game with the highest "Best Rank" possible in each battle? If you own the game, but have not completed the game's Challenge Mode, was there a particular boss battle you got stuck on, or reason you didn't complete it? While I like Punch-Out! and have it on VC, I can't seem to get into this game. (from viewing videos) Maybe soon I'll check out the demo and give it a real chance. scroll to the bottom and look at the last comment I replied to. Gotta be the problem! If you do try the demo though, I would love to hear what you think of it. You aren't the only skimmer around here. Just saying, there may be a post in the history somewhere, not saying where, that has a giveaway buried in the text. LOL, it was a test of my own, to see what was/wasn't read at the time. LOL, that's funny. If it's been in the last ~8 months then I'm not surprised if I was in skim mode, but did try to give things a thorough read. Haha! Nope. Still there. Still waiting. I'll be surprised at this point, if it is ever found. It wasn't even anything big, but I did it as a test of the "skimming".